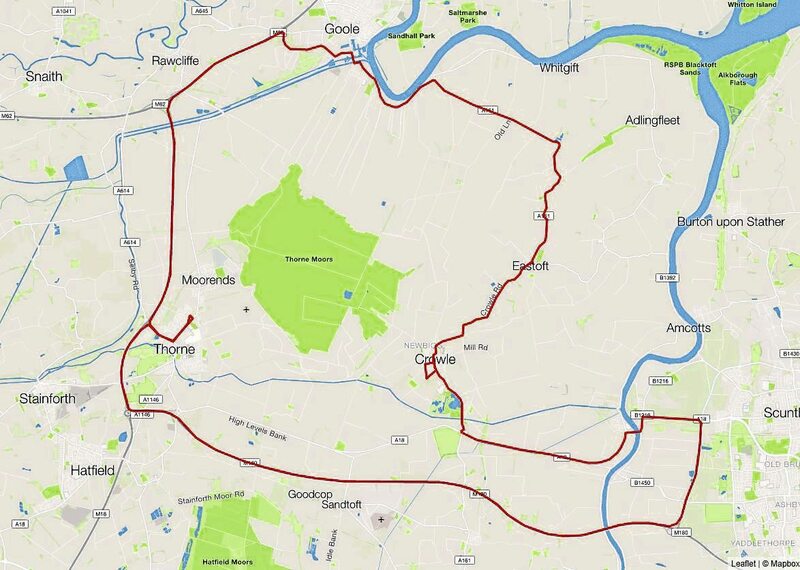 Ferqui SR test route. 48.2 miles. 1 hour 55 minutes. Average speed 23.8 mph. Ferqui’s SR midicoach has been around a while, making the most of Iveco’s increasingly popular Daily 70C18 chassis. We tested the manual gearbox in 2016, but what’s the Hi-Matic automatic like? It says something about Connaught PSV, Ferqui, Iveco or the midicoach sector that Steve Peach is reporting sales of three Ferqui SRs every month. It’s certainly a buoyant sector at the moment, with high demand but competition from everything from rear-engined vehicles which are short versions of their big sisters, scaled-down rear-engined coaches like Yutong’s TC9, and a raft of front-engined midicoaches, mostly based on light truck chassis, like Mercedes-Benz’ Atego. Rear-engined vehicles are often the preference but that choice comes at a premium, both in the ticket on the screen and running costs, with some heavy chassis doing barely better than a full-sized coach, albeit with coach performance and roominess. 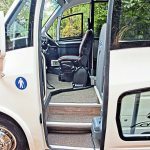 Front-engined coachbuilts take over where van conversions run out of seats, with the magic number 30 the target for many coach hire operators. To hit that figure, you’re into light truck-based vehicles, but with a limited choice of chassis. The 7.5-tonne Atego’s certainly popular and robust – a natural successor to Vario – but Iveco’s 7.2-tonne rated Daily 70C18 chassis cowl is coming up on the rails. On this long chassis, 25 is fairly easy and in this seating capacity is represented by a couple of coachbuilders. Ferqui SR’s 33 seats is exceptional. The question is, does it make any comfort compromises, and can it really challenge the rear-engined coach for class? All body panelling except the original Daily front of the Ferqui SR is made from GRP, mounted on a galvanised steel framework. The usual problem with lengthy GRP mouldings is rippling, viewable if you look along the length of the panels. The Ferqui has as good quality GRP mouldings as this road tester has seen. The finish is very good, and the shut gaps between the panels even and well up to the standard you’d expect. The advantage of GRP is, of course, that stone chips don’t result in rust spots. Together with the galvanised frame, this should result in a midicoach with looks that will last. The SR’s styling has a number of nice touches, including a rounded, sculpted rebate around the windows and fluting along the waist. At the rear, the mouldings are complex, with a trapezoid shape continuing from the rear window shape – perhaps too complex to be great for marketing messages, branding and signwriting. There may be a noise dividend, though, in that shaped panels tend to flex and ‘boom’ less. Ferqui has done a nice job of blending the new body into the chassis cowl, with the driver window decurving to the level of the windscreen and the styling sober rather than exuberant. There’s no driver door and both the passenger door and emergency exit are on the nearside. 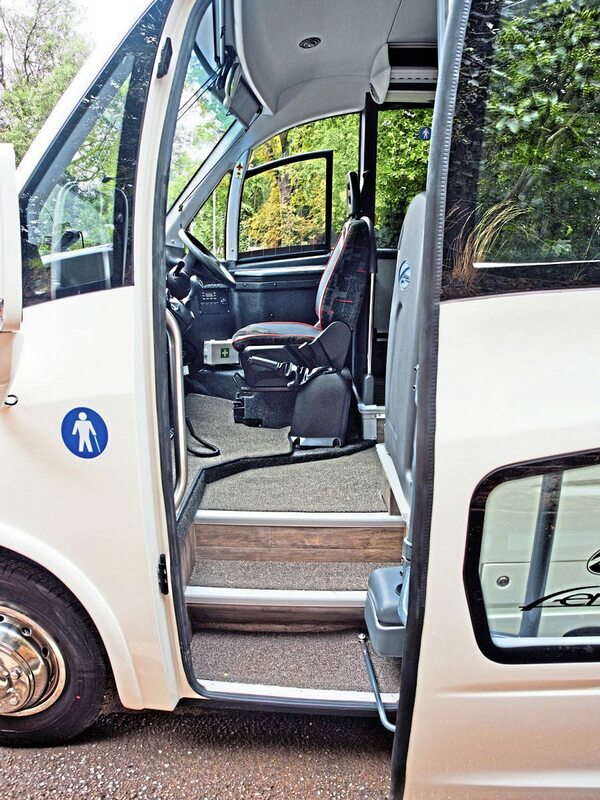 Having the ‘jump’ door on the nearside allows Ferqui to fit a cassette wheelchair lift if required, between the steps. There are two useful luggage lockers between the wheels on the offside. The rear ‘parallelogram’ boot lid on this 33-seat example has the lock release fairly high and the lifting handle very low – our tester remarked that the lock release could have been mounted lower to make it more convenient. The boot on the 33-seater is shallow but runs deep beneath the seats. 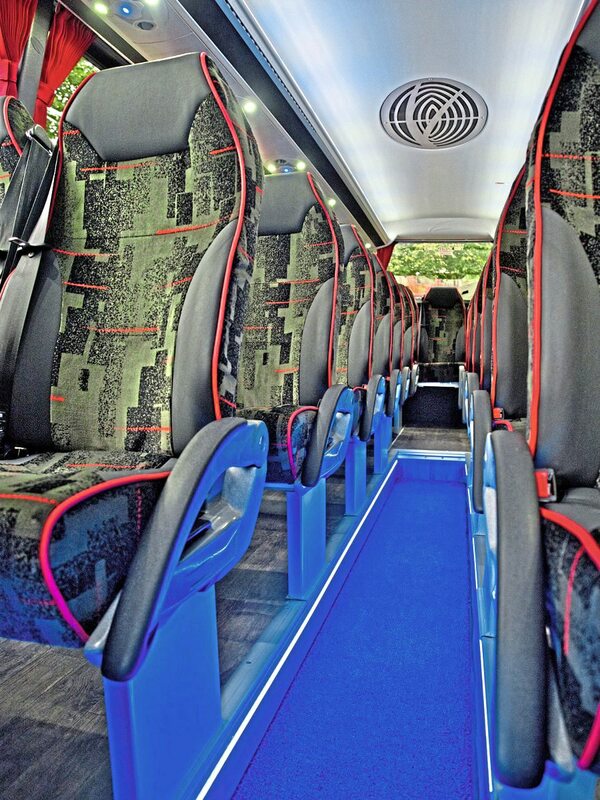 On the 29-seater, the boot is more capacious thanks to the deletion of the rear row of seats. 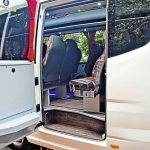 Also, the boot hinges are mounted higher making it lift fully clear of the boot aperture – on the 33-seater, it is hung lower. The boot door closure is very positive, though the latching at the top had to be assisted by pressing the top of the boot lid on this pre-PDI example. The passenger door is an electrical plug door, opening to a three-step entrance to the aisle level. Right of the door is a nicely-finished decency screen and on the left a grab rail. It’s here that the main advantage over some front-engined chassis is clear; boarding passengers face the driver seat, and there’s no engine cowl intrusion into the saloon. This is a major ‘plus’ for most operators. The interior of the SR is attractive, with blue LED mood lights along the sunken aisle and LED uplighters in the luggage rack, plus reading lights in the passenger service units. The seats are from Kiel, and on this example trimmed with a geometric moquette with faux leather headrests and side bolsters, piped in red. A huge variety of other coverings are available including E-Leather though Steve Peach says the faux leather is extremely durable. The seats, which have aisle-side armrests, were very comfortable. The rear row of five seats were extremely closely spaced, such that five large adults would find them a little too cosy; one of the sacrifices of going for maximum seating capacity. As with many midicoaches, the aisle ends just before the final four rows of seats, which helps create the boot space. The test vehicle had wood-effect flooring and a carpeted aisle; again, the operator can specify from a range of flooring options. Usefully, Ferqui has avoided dust traps along the floor edges by curving the flooring up to the sides. The shallow luggage racks carry the passenger service units, LED lighting and ducting for the air conditioning. 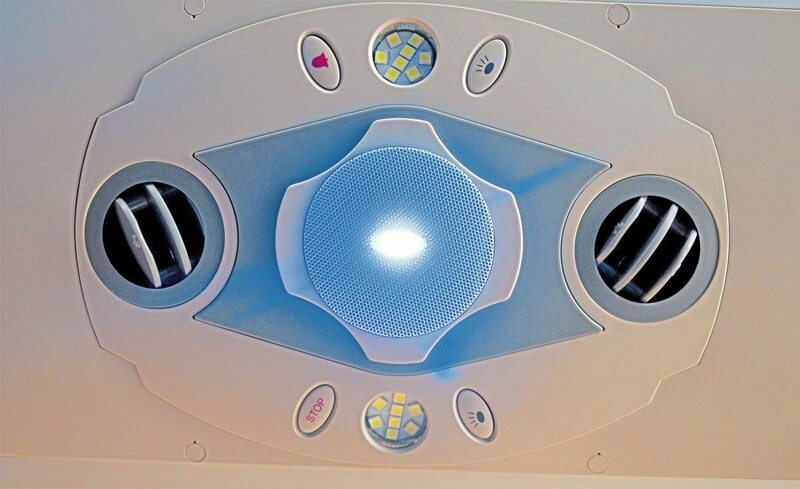 Above, a quality moulding creates the roof lining, into which are let the skylight emergency exit and the filter panel for the roof-mounted Webasto Diavia air-con. 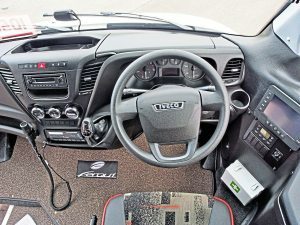 Once our test driver had mastered the controls, we found a very effective saloon air-con system, complemented by the Iveco dash air con for the driver. The interior is bright, the windows deep and with curtains. Each seat pair has a double USB charging socket. The overhead service units are basic but look durable. 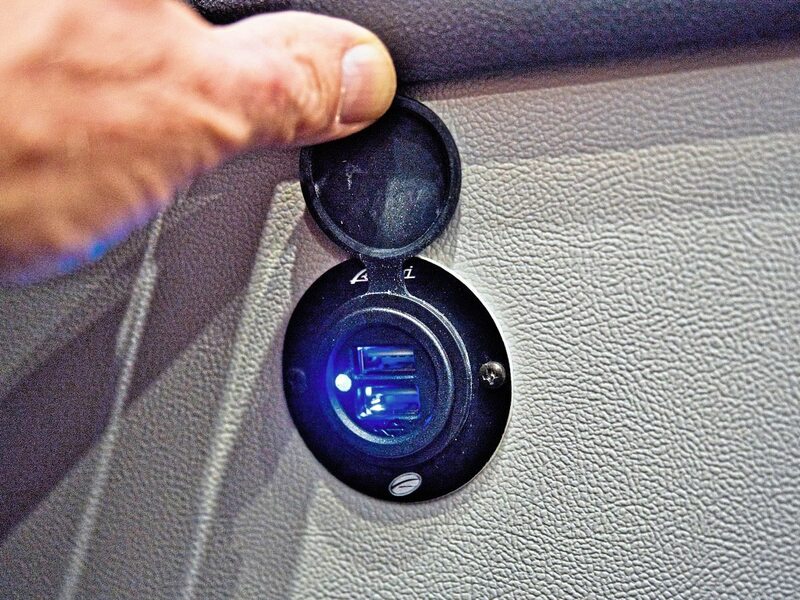 They incorporate some powerful reading lights, air vents, and service call buttons. The driver cab is largely the Daily product, with an additional LCD touchscreen which offers saloon controls, the door control and doubles as the rear-view camera screen. 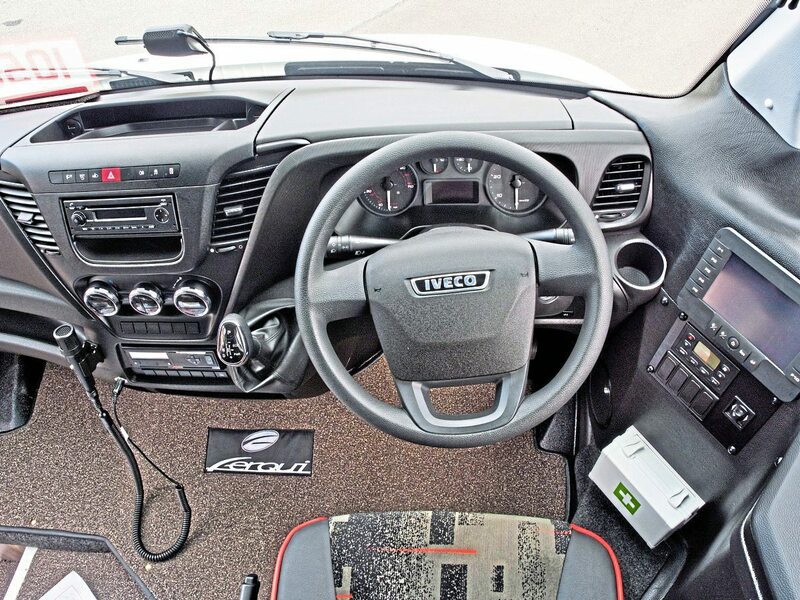 The Iveco controls are clearly marked and well positioned. In addition to a dash slot for an A4 clipboard or documents, Ferqui has fitted a lockable, lidded box right of the driver. Our road tester said the mirror view, via ‘quarterlight’ windows forward of the main side window, was good in almost every respect. The curvature round to the rear of the coach, though, meant that he could not see the rear quarters in them, and he was concerned that, as the window is not heated, misting could be an issue. The driver has an electric window for toll payments, etc, and this window is heated. The multifunction touchscreen right of the driver (with air-con controls beneath it) is bespoke to Ferqui, controlling all the additional equipment such as saloon climate control. Sensibly, the touchscreen has optional push buttons to the sides of the screen; the function of each isn’t obvious until the screen shows its information. 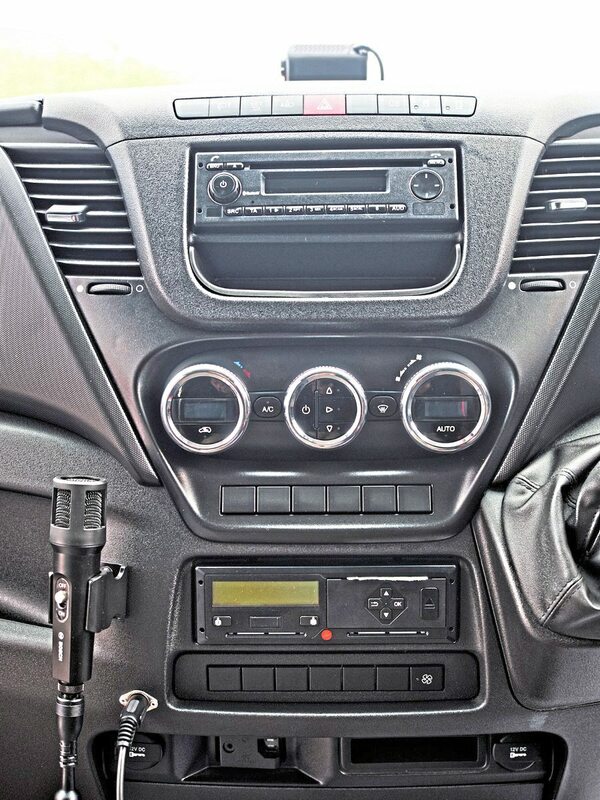 The centre of the dash has the driver air-con controls, audio controls and tachograph. 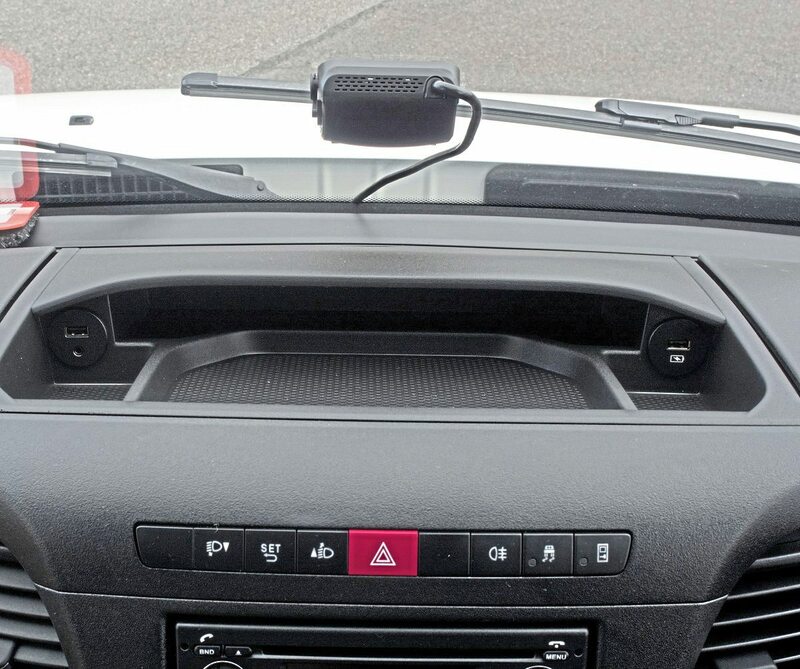 Just above the centre of the dash is the adjustable LDW camera, which scans the lane markings and gives an adjustable audible warning. On the test vehicle, this seemed a little over-sensitive, though further adjustment may have eliminated more of the false warnings. 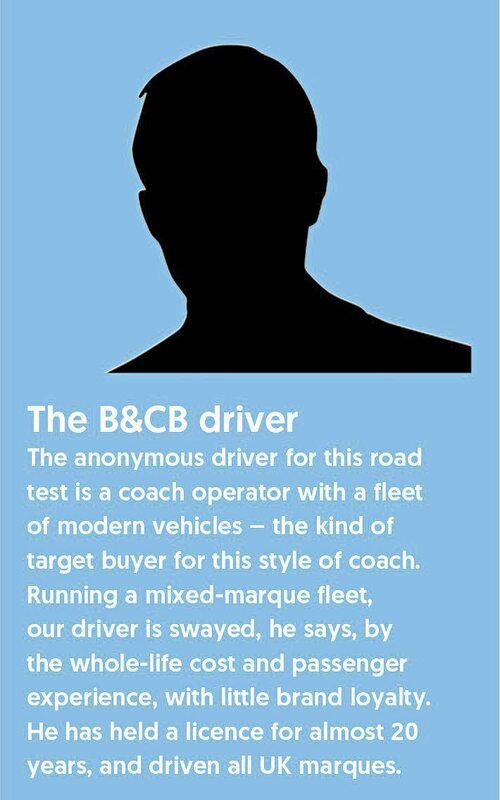 Our road test driver commented immediately on the van-sized steering wheel and the upright driving position, with the dash closer than would be the case on a full-sized coach. This merely reflects the donor vehicle, but large drivers may find that, with the seat fully back against the decency screen behind, the lack of recline may mean a more upright driving position. In all other ergonomic respects, the driver is well-served by sensibly positioned controls and instruments, including a mechanical, floor-mounted handbrake to the left. On the road, the SR performs very well, with brisk acceleration and seamless gearchanges via the ZF-derived Hi-Matic automatic gearbox. The gearshift has a ‘power’ setting though, when selected, this seemed to simply hold gears longer but made no appreciable difference to acceleration or performance. It may be useful for alpine drives but the road tester felt that, on his fleet, he may have this disconnected. It’s immediately obvious how quiet this front-engined midicoach is, the 3-litre, four-cylinder engine being torquey and responsive. Indeed, our test driver says that it may even beat the legendary Sprinter for low noise levels. On the limiter, the tacho is registering a relaxed 2,200rpm. 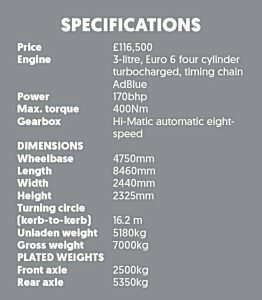 It’s worth mentioning that Iveco claimed lower service costs of the Euro VI at launch; for example, this engine has a timing chain rather than belt, so that’s one less service item, and a service interval of 50,000km. 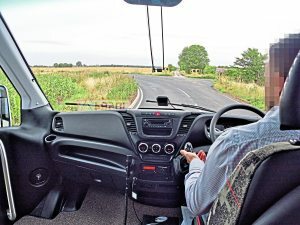 Steering was very precise, requiring no corrections on straight sections of motorway, and was weighted perfectly for cornering, with good feedback to the driver. The view through the windscreen was exceptional, our driver thought, with the A pillars the only obstruction, as with any vehicle. The sunblinds are manually operated, standard items. The wiper arms, oddly, do not ‘park’ at the bottom of the screen, although this was not an issue. On the screen, the LDW camera wasn’t the best-accomplished, with the wiring at the top of the camera housing. On examination, it appeared that the camera unit can take a Micro-SD memory card, though whether for recording a front view was uncertain. It was also adjustable for declination, so the phantom LDW warnings we got occasionally could possibly be cured by adjusting it. The large rear overhang of the coach beyond the rear axle is immediately obvious, and a potential hazard for inexperienced drivers. This is slightly compounded by the mirror view not reaching the rear quarter. In the test, though, the driver felt the rear outswing was predictable. 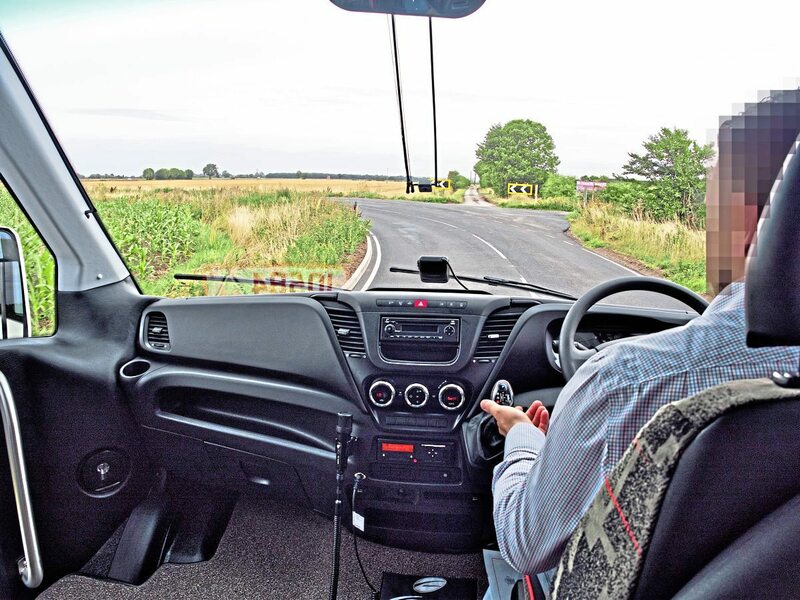 The turning circle, which Iveco says is 16.2 metres kerb-to-kerb, is more than adequate in the road tester’s view. Reversing manoeuvres are, of course, assisted by the rear camera view in the multifunction touchscreen, sensibly positioned just below the driver-side mirror. Braking was also exceptional, being both progressive and powerful. 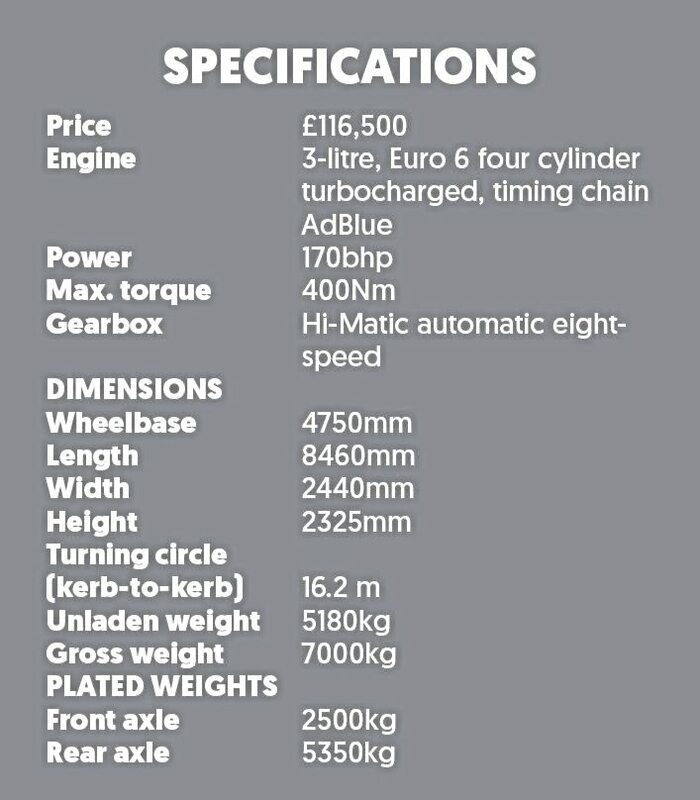 The gearbox negates any real need for the addition of a retarder, offering significant engine braking. This, coupled with the performance, makes the SR a good driving package. The fuel tank holds 100 litres which, with a realistic fuel consumption of around 20mpg or 7.08km/l gives a range of over 400 miles on a fill. One operator, we were told, had achieved 23mpg, though on the very stop-start test route, the example we had achieved just under 18mpg according to the on board computer. This compares very favourably with other midicoaches. 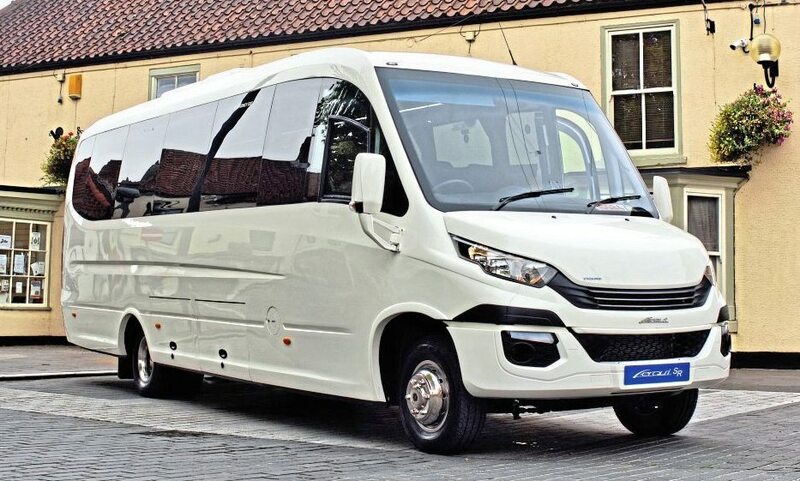 Connaught PSV’s Ferqui SR, imported from Spain, has some tough competition, and not just from other coachbuilders using the Iveco Daily 70C series of chassis. For a start, you cannot disregard rear-engined coaches; they’re expensive in this sector, with price tags of at least £160,000 even for Pelican’s Yutong TC9, but for some operators, the squared coach front and the peace and quiet make the extra worthwhile. For, if front-engined coaches have a fault, it’s the engine. In some, there’s significant engine cowling intrusion into the saloon, sometimes ‘stranding’ the driver. Then there’s engine noise. To be fair, the coachbuilders have made huge strides in soundproofing but it’s still audible. The Iveco 3-litre unit is already a quiet engine, and mostly outside the coach on the Ferqui SR. It’s class-leadingly quiet. Then there’s the ZF-derived eight-speed automatic gearbox. It’s like great bass players in a band – clearly doing something, but hardly noticeable. It’s helped to complete the Iveco package. Ferqui has been building on the Daily since launch, and long relationships between base vehicle manufacturers and coachbuilders usually lead to dependable vehicles. Such is the volume Ferqui produces, the SR has European Community Whole Vehicle Approval… a clear audit of the production process which should guarantee consistency. Certainly, Connaught PSV is very pleased with the limited number of warranty claims. However, the SR isn’t without its compromises. 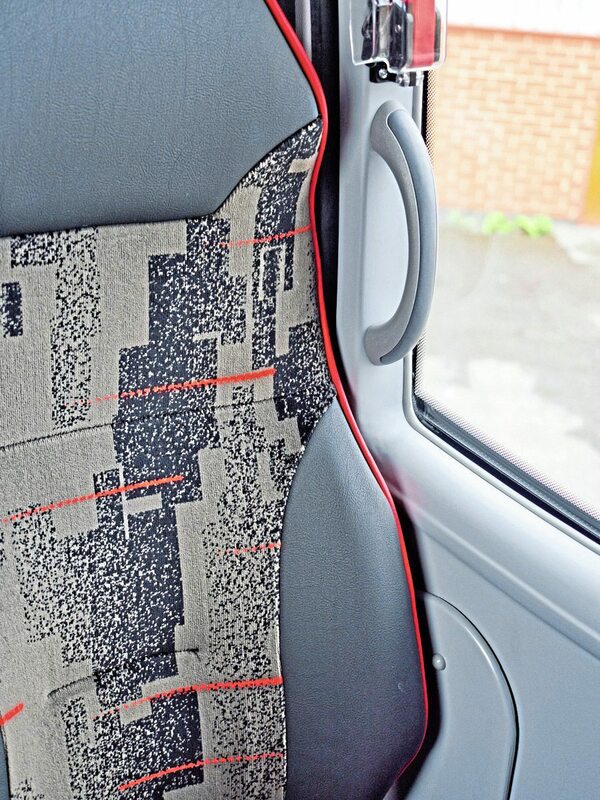 The rear five seats could usefully be depleted by one seat – they would be really cramped for many adults. 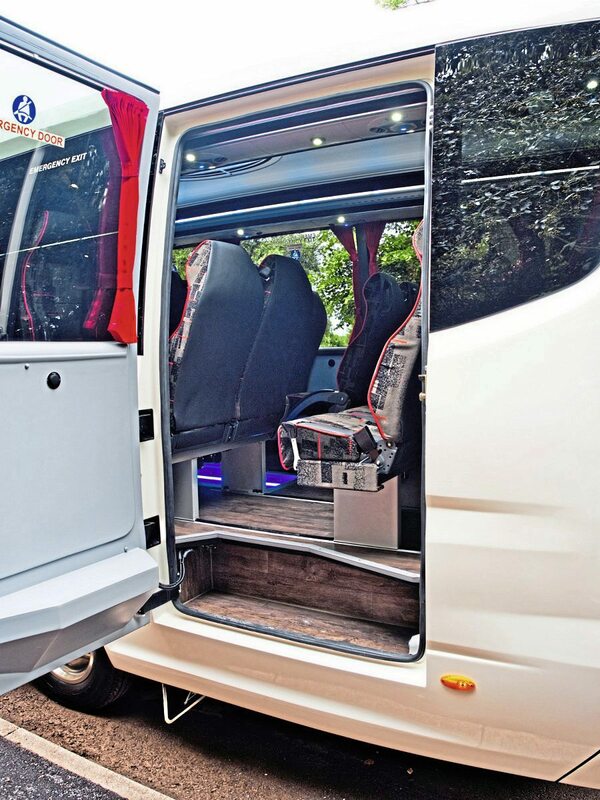 Indeed, any operator wanting to use this midicoach for occasional tour or airport work should consider the 29-seat version which creates additional boot space. Though there are the two, small lockers as well, if you go with the 33-seater, consider adding a towbar, for which the SR is pre-prepared. Drivers need to be mindful of the outswing with such a considerable extension behind the rear axle, though during driving, this did not lead to tail-wagging. We weren’t able to fill the vehicle with passengers, so the whole truth about the handling is something you’ll have to ask operators of the SR. In common with many small coaches, the luggage rack inside is shallow, and chiefly a conduit for the excellent ventilation system and the top-quality passenger service units. 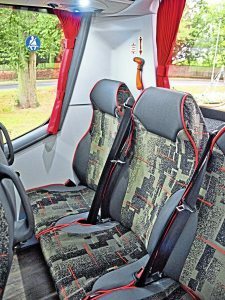 Although the main seating is of great quality and comfort, the interior is snug; that said, it never felt claustrophobic. Connaught PSV prides itself on its relationship with Ferqui, and will fine-tune the SR to meet the operator’s demands. So if you don’t like what you see on the demonstrator, just ask for what you want. 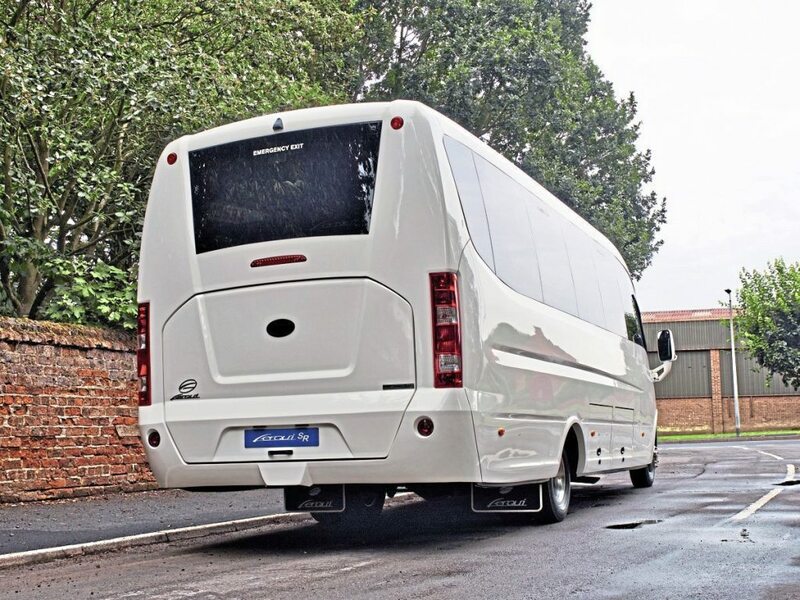 What you will be buying is based on Iveco’s best ever heavy van chassis, bodied by a very experienced coachbuilder, and a real budget-buster.